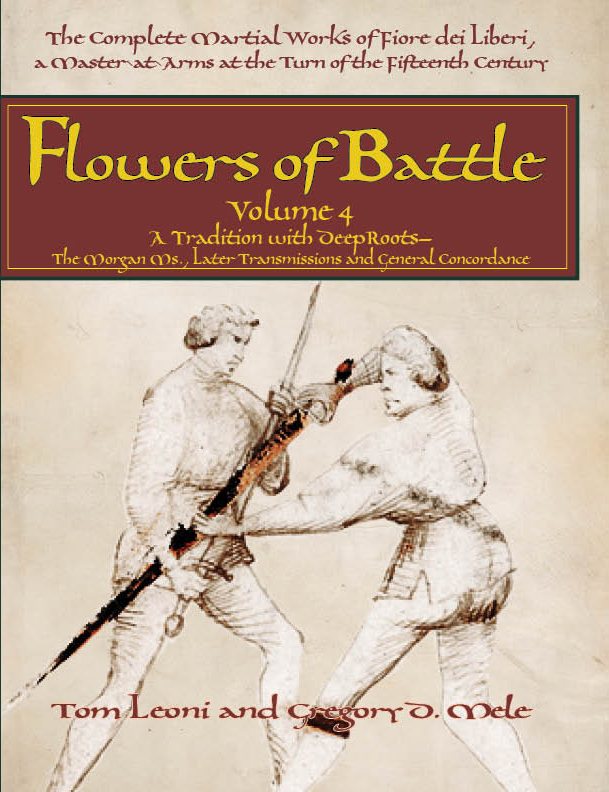 Flowers of Battle: The Complete Martial Works of Fiore dei Liberi now on Indiegogo! Few historical fencing masters are as dear as Fiore dei Liberi to the heart of the modern Historical European Martial Arts (HEMA) community. Credited by fencing historians as the father of Italian swordsmanship, his magnum opus, il Fior di Bataglia (The Flower of Battle), composed in early 1409, is one of the oldest, most extensive, and most clearly elucidated martial arts treatises from the medieval period. Four versions of il Fior di Battaglia—the earliest surviving Italian source on the martial arts—survive today and form the basis for the modern study of armizare. Each has important similarities to and differences from each other. The key similarity is the organization of the material, which systematically covers abrazare (wrestling and hand-to-hand fighting), daga (dagger, with an emphasis on self-defense and armoured combat techniques), spada a un mano (single-handed sword), spada a due mani (two-handed sword), spada in arme (sword used in armour), azza in arme (poleaxe used in armour), lanza in arme (spear used in armour), and finally all weapons a cavallo, or on horseback. The key martial techniques, called zoghi or “plays” by Fiore, are identical between manuscripts, but each manuscript contains plays and key information not seen in the others, and each is done in a different artistic style. This ambitious project goes well beyond anything we have done before: a four (volume set of illustrated, hard-cover books, combining color, 1:1 facsimiles of the master’s original manuscripts; professional, annotated translations, and extensive, peer-reviewed essays. Held by the J. Paul Getty Museum in California, MS. Ludwig XV 13 is the largest and most complete of the four surviving manuscripts. Dedicated to the young, bellicose Niccolò d’Este, Marquis of Ferrara, this edition of Fiore’s work details the names of his famous students, the five duels he fought against rival masters, and explains in detail the instructional schema he developed to make the work accessible to students. Beginning with grappling, it progresses through the various sub-systems of armizare, ending with mounted combat. 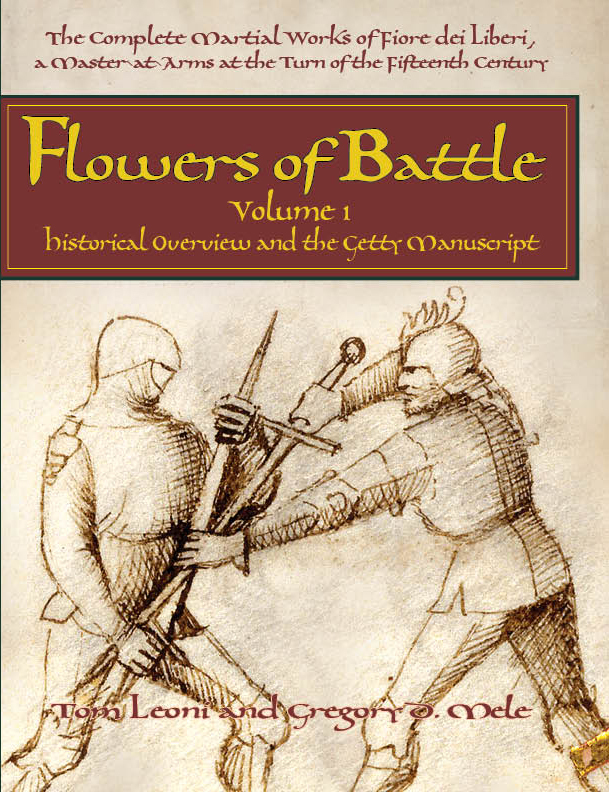 The Flower of Battle’s relationship to other medieval combat manuscripts. Songs of Ice and Rapiers? A Game of Condottieri? New Articles from the Freelancers! Now that the holidays have passed, we thought that we’d bring you a Twelfth Night present to keep your mind occupied as you recover from a month of heavy food, family gatherings and office parties: three new, free articles. In Ancient Swordplay, Tony Wolf not only brought readers to the “Elizabethan Swordsmanship” revival of fin de siecle London, he also introduced them to the little remembered – or in Anglophone circl es, unknown – work oftheir “spiritual heir”, George Dubois (1865 – 1934). Dubois wrote and published extensively, and we celebrated his pioneering work last year with a blog post on the man, and making his Cemment du Defendre, Le Point d’ Honneur et le Duel, and Essai sur l’Escrime: Dague et Rapiere freely available on the Freelance website as downloadable PDFs. Of these varied works, Essai sur l’Escrime: Dague et Rapiere (1925) is perhaps most interesting to students of Historical European Martial Arts. In this short work, Dubois and his associate Albert Lacaze presented an innovative system of competitive fencing with rapier and dagger, marrying historical technique to French classical fencing. Although Dubois became the better known of the two men, it was through Salle Lacaze that this tradition continued and survived to this day. This combination of historical swordplay and living tradition is the sort of thing that medievalist, Francophile and Prévôt d’Escrime could not resist. Ken has spent time researching and studying this system of “modern French rapier”, and in the article Lacaze Sword and Dagger he supplies a short training curriculum to jump into a fast and furious style of sword and dagger fencing. Modern/classical fencers will find the method a logical adjunct and new twist to their training, while students of historical swordsmanship will get an interesting glimpse into how the ancient traditions were studied and adapted a century ago. Whether you are historian, martial artist or enthusiast, privately ask yourself how many of you firs found a love for times past through fiction? Be it Ivanhoe or the Hobbit, many of first felt wonder of another era portrayed through the words of favorite author. Of course, no matter how vivid that author’s portrayal might be, it doesn’t mean that portrayal is accurate – particularly when the world is not even our own. Over the holidays, Ken decided to tackle this very topic. Hanging up his provost’s epee for his historian’s pen, he turns to Westeros, the mythical world of George R R Martin’s Song of Ice and Fire. Martin’s works are blockbuster bestsellers, the basis for an ongoing television series, and has been an entree for a number of folks to find out “just how do swords work”? In Down and Out in Westeros, or:Economy and Society in George R.R. Martin’s Song of Ice and Fire Ken decides to reverse that question and ask, “Does Westeros really work as a medieval society?” You might be surprised! Finally, our titles on armizare, the medieval Italian martial art recorded by Fiore dei Liberi, were among our most popular titles in 2012. Dei Liberi himself is a bit of a shadowy figure – a man whose existence is provable, but who is better known through whom he taught than the scant details of his own biography. Gregory Mele, Freelance’s co-founder, publisher and sometimes author takes a look at the life of Galeazzo da Montova, perhaps the most famous of these students. Giving Ancient Masters a New Voice: an interview with Tom Leoni, translator of Fiore dei Liberi’s the Flower of Battle. Tom Leoni is well-known in the Western Martial Arts community as a researcher and translator of Renaissance Italian fencing texts. His The Art of Dueling (2005) brought the magnum opus of the famed 17th century sword-master, Salvatore Fabris to an English-language audience for the first time. Now out of print, used copies are eagerly sought, often commanding ridiculously high prices on Ebay or ABEBooks. In 2010 and 2011 Tom expanded on his investigation into 17th c swordplay with Freelance’s Venetian Rapier and Ridolfo Capoferro’s The Art and Practice of Fencing, thereby making the complete “holy trinity” of Italian rapier available in clear, concise English. In 2010’s Complete Renaissance Swordsman: A guide to the use of all manner of weapons, Tom stepped further back in time, opening the doors to earliest surviving text of the Bolognese school of swordplay, which contained a vast curriculum of weapons. But before joining Freelance, in 2009 Tom had self-published a modest little book – a translation of the earliest known work on Italian martial arts, the renowned il Fior di Battaglia (The Flower of Battle) by Fiore dei Liberi. 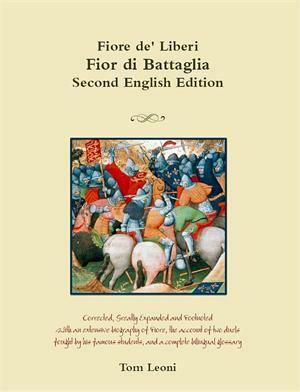 This translation quickly became the seminal translation in the WMA community, and forms the basis of study in Robert Charrette’s Fiore dei Liberi’s Armizare: The chivalric martial arts system of il Fior di Battaglia. In the ensuing three years, Tom has substantially reanalyzed, revised and expanded his translation. We sat down with him at the SCA’s Pennsic War to ask him how a staunch student of the Italian rapier found himself suddenly immersed in a study of the two-handed sword, wrestling, pollaxe and mounted combat, and why creating a second edition became an obsession. Q: You have been translating Italian martial arts manuscripts since 2005, but your focus has always been on the 16th and 17th centuries. 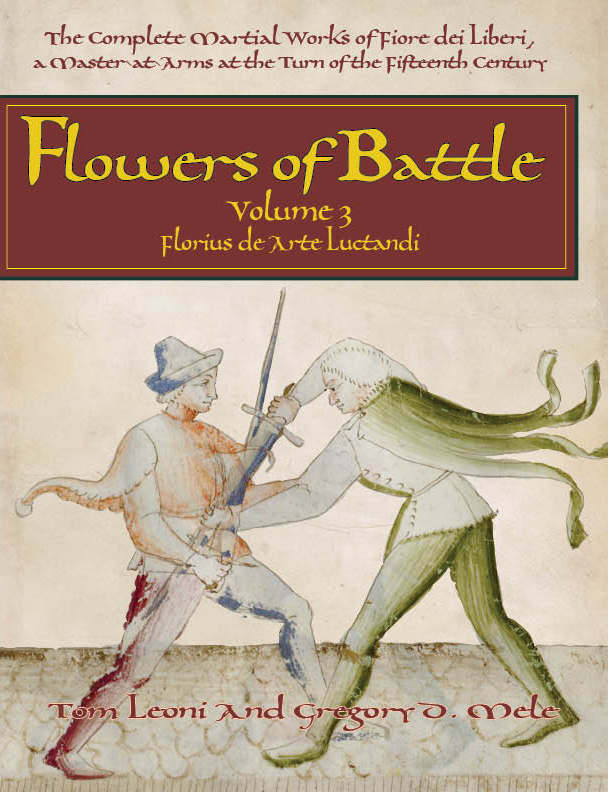 How did a translation of Fiore dei Liberi’s “Flower of Battle” come about? It was Scott Wilson (owner of Darkwood Armory) who initially commissioned the translation. As a serious Fiore student, he wanted to have a single, reliable and consistent translation of the Getty manuscript at a time when there were many fragments of translations available on the Web, some more dependable than others. So he came to me and promised me to make me a custom rapier if I would complete the translation by the 600th anniversary of what we consider to be the date of the treatise. I complied, my original translation came out in 2009, and the beautiful Darkwood custom rapier hangs proudly in my salle. Q: Can you answer this question for the Historical European martial arts community once and for all: is il Fior di Battaglia written in literary Italian or dialect? Actually, neither! The book is written in vernacular, which is somewhere between the literary language and the dialect. Think of it as the proper language spoken with a heavy regional accent and using a simplified vocabulary. In writing, the most telltale sign of vernacular is the spelling, which approximates on paper the way the author would have pronounced the language; in our Master’s case, his spelling was heavily influenced by what linguists call Lombardisms (for instance, z or ç for g or c, gh for c, d for t, etc.). But once you account for the several consonant shifts, a few vowel shifts and the frequent elimination of double consonants, you get a fairly standard Italian–although definitely not as polished as the literary language as far as grammar, vocabulary and style. For an example closer to home, imagine a Joe Pesci spelling words as he pronounces them in his thick New York accent (e.g., “the two yoots”) or a Jeff Foxworthy doing so in his signature Southern drawl (e.g., “less do us sum rasslin’”): the spelling is unorthodox, but the meaning is still clear. Had Fiore written in true dialect, the Italian would be virtually unrecognizable–for instance, he would have used terms not found in Italian, he would have contracted many words, while with others, he would have dropped the final vowel or even the final syllable. Besides, writing in dialect for a wide audience was not at all common in Fiore’s time–and indeed, throughout the history of Italian literature. Q: One of the other things that your translations have become known for is capturing the voice of the original author, rather than using your own. How would you describe Fiore’s personality as an author? I am glad that some think I convey the voice of the original authors. Translating is truly an art-form, and my goal is to keep getting better. Returning to grad-school–especially having to translate under the rigorous guidance of the head of the Classics department at Catholic University–has certainly given me more food for thought as far as translating. Fiore’s personality as an author is truly interesting–and I think unique in the history of Italian fencing. While most Masters speak in a single voice, Fiore writes in at least three personas: the meticulous teacher of the art he loves and has learned to describe so well; the lovable boisterous soldier in the tradition of Plautus’ miles gloriosus; and the self-deprecating, easy-going man who never lost his sense of humor despite the respect and the status he has earned, who calls himself “a poor old man” and “Fiore the student.” The Fiore who comes across from the pages of his treatise is someone I would have loved to know, train and share a drink with. After spending so much time with him, I think of Fiore as a friend, while even “my” Fabris I view more as a father figure, since he only spoke in one voice–the voice of absolute authority in his field. Q: What led to creating a second edition? Three things mainly. One, the desire to review the translation as a Fiore student, rather than merely a historical fencer with a linguistic background; two, the awareness that working from a high-resolution version of the original manuscript was preferable than working from a transcription; three, the desire to include biographical material, a contextual study on the judicial duel (which is one of my main areas of academic interest), the account of some of the duels fought by Fiore’s students, as well as a thorough bilingual glossary on the Master’s terminology. The result is something I’m quite pleased with, and besides the complementary material I have mentioned, I would rate this translation a good 25-30% better and more accurate than that of the first edition. Also, I was able to offer plenty of footnotes giving suggestions as to the practical aspect of Fiore’s plays, now that I have gone through most of the book several times sword-in-hand (so to speak). Q: There’s a rumor that after spending this much time with the old Maestro, your rapier now has to compete with the longsword and abrazare in your heart. Is that true? It is absolutely true. Rapier is like the violin, while the medieval arts are like playing guitar. Both instruments are sublime and capable of perfection, but the guitar gives you satisfaction sooner, comes in many more varieties and can have an air of cool nonchalance that the more exacting violin does not have. 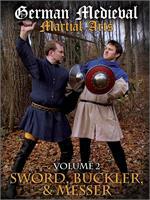 I view medieval martial arts in the same light. Thanks to Fiore, I am learning to wrestle, I am getting proficient at fighting unarmed against a dagger, I get to use a whole plethora of interesting weapons under a single, coherent system, and I even get to fight in armor. Fiore also inspired me to get back on a horse, something I used to love when I was younger but I had not done in years. Something else that attracts me to Fiore is the fact that there is a lot more still to discover about his world, which as a researcher is like a newly-found gold mine. This is not to say that my enthusiasm for the rapier has diminished; only, it is hard (I would say impossible) not to be seduced by the system of Fiore and the context in which his art was practiced. Q: There are a few questions that come up when English speakers with a bit of Italian look at Fiore’s terminology. Why do you think he used “abrazare”, for example, rather than “lotta”? Or “colpo” rather than “taglio”? To those of us who didn’t grow up thinking in Italian, what is the lesson to be learned there? The lesson is that as a late-medieval man, Fiore understood his categories! Lotta is the whole of wrestling, while abrazare is a part–namely, arm-wrestling (as Fiore gives away on Folio 45 R, when he says “a play of abrazare [means] a play of the arms”). Colpo is the whole, a generic term for blow, action or attack, while taglio is a part–namely, a cutting attack. In other cases, it must have been the tradition that affected terminology; for instance, the name or descriptive adjectives of some guards and some strikes are unique to Fiore (as far as we know today) and must have come from a Master-student lineage particular to his area or his instructors–e.g., Posta di Donna, Sottano, Colpo di Villano, Guardie Pulsative, etc. I am looking forward to discovering what further research will yield in this regard. Q: Now that you’re Fiore’s student, and not just his mouthpiece to the Anglophone world, how do you think his work “measures up” to the works of the later Renaissance that you have spent so much time with? It measures up excellently. His treatise is so clear and thorough, we don’t have an excuse for getting Fiore wrong. We may argue about such minutiae as how far off-line you need to step, or whether or not you need an additional pass when you deliver your riposte by fendente in the Peasant’s Strike or whether there is a left Finestra in longsword, but as far as the main ideas and principal motions, he leaves no room for speculation. This is also greatly aided by the late-medieval pedagogical model of illustrating most actions, as well as by there being four extant version of his treatise. I wish that at least one among the great 16th century Bolognese Masters had adopted Fiore’s pedagogical model–we would know a lot more about that style than we can at present, with their (largely) non-illustrated, discursive instruction. I would say that up until the 17th century, Fiore has written the most valuable Italian treatise for us historical martial artists–and even compared to more recent treatises, he more than holds his own. Q: There seem to be a lot of “memes” about Fiore’s work, perhaps because no complete, vetted translations of his work are readily available to the larger community. If there are a few of these that you could put to rest right now, what would they be? I am glad you asked! The most macroscopic meme of recent vintage is that Fiore somehow wrote in code, and that his text is cryptic and hard to understand. Quite to the contrary, Fiore wrote as an expert instructor, who needed very few well-tested words to describe what he wanted to convey. His goal was clarity, and he achieved that admirably, in my opinion. How much clearer, for instance, can you get than his description of the Peasant’s Strike? Sure, the fact that every action is illustrated helps, but how many treatises can you name that spell out the footwork with such consistent precision–in virtually every action? How many can you tick off that tell you exactly where to put your hands and your body and in which direction to push or pull as you wrestle? How many that name and describe all the turns that your body, your feet and your sword can make? As you read Fiore, you really get the sense that he wants you to know, he wants you to get it. Which is why I said that you simply can’t get Fiore wrong–although performing his actions correctly and efficiently is of course a matter of arduous practice. Then of course there is the meme initiated (or perpetuated) by the Victorians, namely, that Fiore wrote a treatise in which there is essentially no theory and no finesse, only brute force. A few hours of training are enough to disprove that: can you imagine wildly muscling your way through the first few plays of abrazare? Or trying to “win” a crossing by pressing hard against the opponent’s blade? But then, the Victorians’ goal was different from ours: theirs was to trace an evolutionary pedigree (documented or half-legendary) for their own style, while ours is to piece together the original arts on their own merit, understand them and perform them to the best of our ability. 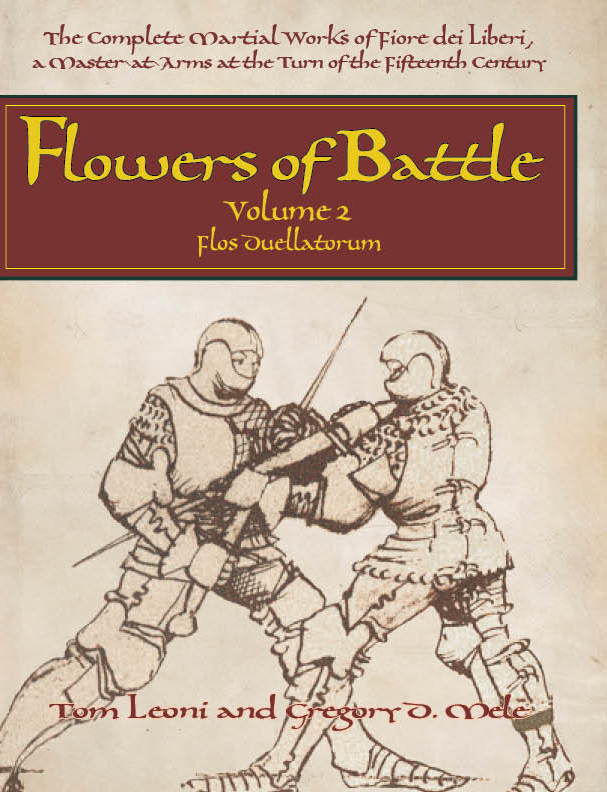 Fiore dei Liberi’s Flower of Battle, 2nd Edition is available exclusively from Freelance Academy Press! But it direct, and receive an added bonus: an annotated translation by of the closely related Morgan Ms, correlated as a correspondence to the Getty Ms and red-lined to make it easy to spot the differences, additions or deletions of text. “A VIST FROM FIORE” OR ‘TWAS THE NIGHT BEFORE MY JUDICIAL DUEL”…INTRODUCING THE ARMIZARE VADE MECUM! Nevertheless, the Christmas season is officially here. So, we decided to bring you a little something special to inaugurate the holiday season. Sometimes called “the most well-known verse ever penned by an American”, the poem “A Visit from St. Nicholas”, also known from its first line as “‘Twas the Night Before Christmas”, was first published anonymously in 1823 and generally attributed to Clement Clarke Moore. Written far from the land of his birth, it forever blended the Dutch images of St. Nicholas and the British Father Christmas into today’s conception of Santa Claus, including his physical appearance, the night of his visit, his mode of transportation, the number and names of his reindeer, as well as the tradition that he brings toys to children. So perhaps it is only fitting for our holiday surprise that an Englishman in Finland composed a poem of his own about a long dead Italian swordsman, Fiore dei Liberi in the Armizare Vade Mecum. What do all of those funny words mean? We’re glad you asked! Vade Mecum (vā-day-ˈmay-kəm) 1: a book for ready reference; a manual; 2: something regularly carried about by a person. From Latin, “go with me”. Dei Liberi’s tradition is preserved in four distinct, beautifully illustrated manuscripts, which have formed the basis for a world-wide effort at reconstructing this ancient fighting art. What many students of the art do not realize is that Fiore wrote in the loose verse common to many medieval authors, who used rhyme to aid in memory. However, the size of Fiore’s work and length of each passage makes memorization difficult. By contrast, mnemonic “teaching verse” was part and parcel of the German masters of the same era. To balance the scales, Guy Windsor, one of the most renowned authors, researchers and teachers of armizare has sharpened his quill and penned this reference book for the modern student. 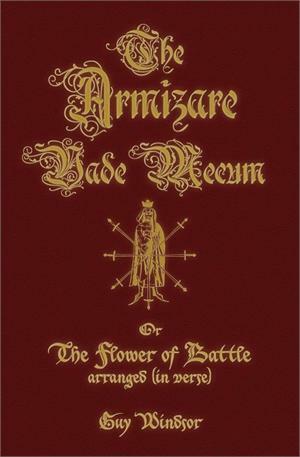 Both pithy and profound, at times comically gory, the Armizare Vade Mecum is both an homage to this famous swordsman and a practical aid in learning his deadly art. The Armizare Vade Mecum is our first ebook, and we’ve tried to make it something a little special. Featuring a beautiful design that harkens back to the medieval manuscripts that inspired it, we are certain you will find Guy’s “little book” to be as charming to view as it is to recite. With line art by Robert Charrette, it also forms the perfect companion in look and theme to his incredibly popular Armizare: The Chivalric Martial Arts of Il Fior di Battaglia. There is no real mystery in this; these seven guards, or some variation therein, are the positions that one simply *must* move through with a sword to make full and half cuts, underhand and overhand thrusts. While masters of the rapier would later reduce the number of guards to four, this reduction reflected a new emphasis placed on the thrust, rather than a blance between point and edge. It is also interesting how these “primordial” guards are prioritized. Emphasis is almost always placed on three positions. The first is a low guard on the left side, point angled behind the opponent. The second guard is carried high on the right side of the body the point aimed at the adverary. In the third, the point is rotated behind the swordsman’s head, threatening a strong cut from above. In fact, these three guards appear because they are the simple action of drawing the sword into an immediate preparation for a thrust or a cut. I ndeed, although most masters show the sword drawn in the first guard, Talhoffer and Viggiani both illustrate the guard with the weapon still sheathed, (although at times Talhoffer also shows the weapon unsheathed). This position of the sword is called Coda Lunga; it is very good against the lance and any other handheld weapon… Bear in mind that this guard counters all the blows both on the mandritto and the riverso side, and is usable against right- or left-handed opponents. We will now see the plays of Coda Lunga, from which you always parry as I have described in the first illustration of the guard. …hold your wrist in such a fashion while you draw it forth that you do not make a turning; and do it so that your hand rises high, and to the rear on your right side, so that the point of your sword is aimed at my chest, and downwards somewhat toward the ground, and stop it there, with the true edge of the sword facing the sky, and the false toward the ground, taking care in the selfsame tempo that the rovescio travels, that you make with your body a little turn in such a way that your left shoulder is found somewhat more forward than your right, and that your left arm follows the right through the forward side, so that it is found toward the right side; and make additionally a slight turn of your left leg on the point of your foot through the draw, and the heel should be somewhat lifted from the ground; and together with this make your right leg lie extended, with the body somewhat erect: you see how I do it? I’ve found you completely open and hit you in the head with no trouble. And if I pass forward with my rear foot, I can perform some close plays against you, like binds, breaks and grapples. Fiore dei Liberi was definitely a “keep it simple, stupid” kind of guy, so we shouldn’t be surprised this basic defense with two ripostes, depending on where your point is located, keeps recurring in European swordplay. Talhoffer chooses to illustrate it in several of his books, doing dei Liberi one better by making the first cut an attack to the opponent’s arm (an option that Viggiani drolly calls “a very good parry). Long after dei Liberi and Talhoffer were food for worms, the “universal parry-riposte” persisted. 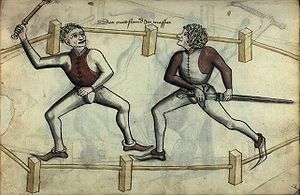 Viggiani describes it as the foundation of all swordplay, and his “30 minute lesson” on how to survive a duel comprises nothing more than: make a rising parry, followed by an overhand thrust, recover back into a low guard on the left. Wash, rinse and repeat until your adversary is dead. Although Giovanni dall’Aggochie (1570) thought that a swordsman challenged to a duel might wish to know a bit more than this before entering the champ clos, the universal parry and its two possible ripostes still forms the basis of his notes on “Preparing for a Duel in 30 days. As I get ready to finish this work, I think it may be useful to end it with a brief dissertation that illustrates the virtues of the prima and quarta guards. The prima strikes the opponent while the quarta defends against him—the beginning and the end of any honorable quarrel. The quarta defends against any attack (feint or earnest), while the prima strikes the opponent. It is, however, important to remark that these two guards are inseparable companions, and that one ends where the other begins; in other words, they begin and end without an actual beginning or end. The prima starts high and ends in quarta rather low, and this for two reasons. Firstly, if the opponent attacks you with a thrust or a cut, you can parry with a riverso while passing with your left foot somewhat towards the opponent’s right side; you can then push your right foot forward and strike him with an imbroccata to the chest, at the end of which you would again be in quarta. Secondly, the opponent would only be able to attack your right side, which makes it easy to defend with an ascending cut from the quarta. Make sure you perform these actions with a brave countenance and an eye quick to spot where the opponent is open and where he is well defended. Also, make sure you have strength and readiness in your legs, arms and hands, swiftness to parry and strike, and agility in your body. Synchronicity is sometimes an author’s best friend. As I was working on this post, I had thought to include a mention to the Sikh martial art of Gatka, a newer derivation of older, traditional fighting arts. The Sikhs are famed swordsmen, so it is no surprise that a large part of Gatka training involves the sword, sword and buckler, and stick. Since many an enemy has learned over the centuries that the warriors of the Punjab know their way around three feet of sharp steel, it is probably also no surprise that as one watches Gatka sparring and warrior dance demonstrations, some familiar actions emerge. Enter synchronicity. Jack Chen maintains an excellent website called Chinese Longsword; a site of translations and videos dedicated to reconstructing the lost weapon techniques of China. 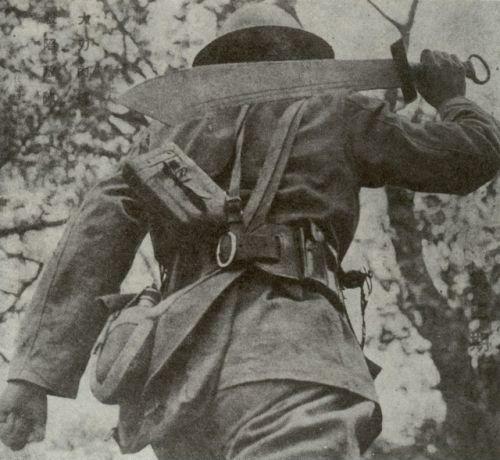 One section of the site is dedicated to the Da Dao (“Big Saber”), a heavy, two-handed falchion, made famous when the 500 sword-wielding members of the 29th Division of the Chinese Nationalist Army used the sword to hold off the Japanese for seven days and nights at the battle of Xifengku. Before it was done, the “Big Saber Contingent” slew over 3000 men. An impressive head-count, but hard won: only 20 of the swordsmen survived the battle. “Many Tonbei Quan masters were involved in training the troops. My teacher talked to some of them during the 70′s and 80′s. According to those masters, the techniques they devised and taught to the general troops where no more than 10. In fact most of the time only one technique was used – a powerful upward sweep to knock (磕) the incoming bayonette away, and at the top, reverse course for a powerful cut (砍) downward toward the neck. Jack Chen also notes that this same technique for the Da Dao was taught generations earlier by Yu Da-You, a Ming Dynasty general who defended China’s shores against Japanese pirates. General Yu recorded this technique in the sword treatise section of his book Zheng Qi Tang Ji (Book of Vital Energy). Mr. Chen provides a translation of this training manual and also links to a number of old video clips of the Chinese arm training with the “Big Saber” on his website. Fourteenth century Germany and 20th century Manchuria might not have much in common on the surface, but they do have this: form follows function, function follows form, and there are only so many ways to both wield a sword and to teach its use quickly and efficiently in a short period of time. Viggiani, Dall’Aggochie and Capoferro knew that, and clearly so did the teachers of the 29th.